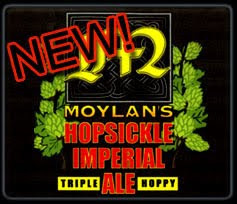 To be honest, I've never had anything from Moylan's Brewing Co., so I wasn't sure what to expect. After a couple of sips, it was clear that I've been missing out on something great. The Hopsickle Imperial IPA clocks in at 9.2% ABV, but the real story is the impressive and dramatic amount of hop flavor that is packed into this beer. I'm not always the biggest fan of the "super hop beer" trend, as it seems like some breweries are taking a questionable product and dumping hops into it. I can say with conviction that this is not the case with this beer. I feel like I could grow hops just by spitting on the ground after this beer. After all of the Octoberfest beers that I had this fall, the Hopsickle is a welcome change of pace.